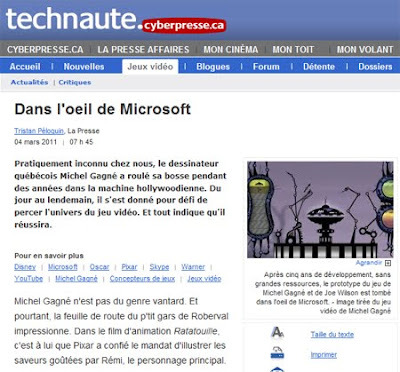 Insanely Twisted shadow Planet has caught the eyes of La Presse, Canada's largest francophone newspaper. They did a video interview with me a few days ago, and today, they published a cool little article in both the printed and on-line version of the newspaper. Here's a link to the article. My apologies to my partner, Joe Olson, who gets referred to as Joe Wilson in the article. Monsieur, je ne parle pas le français. Sacrebleu!